Of all the roofing options available for your home, asphalt is by far the most popular. An estimated 80% of all American houses are built with asphalt roof shingles because of their performance, as well as their price. Click on any manufacturer logo, or contact us with any questions, to see which may best fit your need. Texas receives more than its fair share of damaging hail. Impact Resistant shingle products are designed to resist damage from impact and high winds. They meet the most stringent standards for impact resistance (Class 4) set by Underwriters Laboratories (UL), and wind resistance set by UL and the American Society for Testing and Materials (ASTM International). Some major insurance companies offer homeowner discounts for the use of roofing products that receive a Class 4 rating. 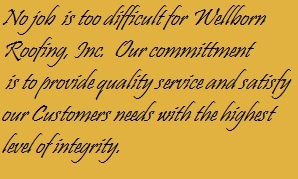 © Copyright 2010-2018 Wellborn Roofing, Inc. All Rights Reserved.